Description: Deep within an impenetrable valley covered by coagulated pinelands lays two secret shrines of the forest hidden by a dense layer of mist. Deep within an impenetrable valley covered by coagulated pinelands lays two secret shrines of the forest hidden by a dense layer of mist. Parting these two shines, a mysterious waterfall fuels the mist which cloaks these shrines. Even though it is unknown who built the shrines or what they are used for, this map proves to be an excellent battle ground for the capture the flag game type with its variety of routes, turns and twists between the 2 shrines. 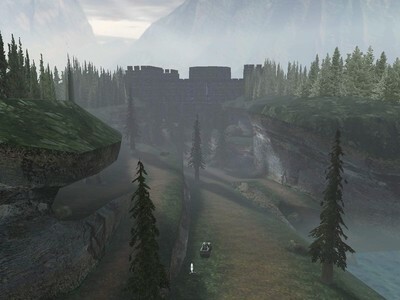 This map is also ideal for team sniper game types with 4 to 6 players with its tactile sniping locations and also for much larger scale team slayer matches with 10 to 16 players with its wide open spaces for vehicular balanced out with combat and close and long ranged on foot combat with its availability of anti-vehicle weaponry. 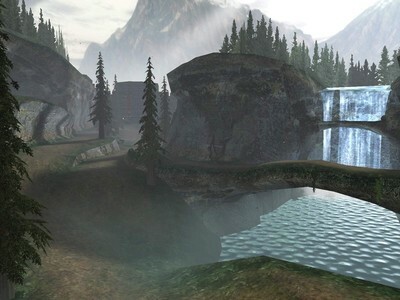 This map also includes lots of places to explore and sights to see while the game slows down. -New heath, radar and shield meter for the HUD. -Needler shoots a secondary projectile which attaches to objects surfaces and detonates 30 seconds later. This map was designed, modeled and textured by me. Special thanks goes out to Lightning for his H2 styled multicolored teleporters and to all those who helped out with the early testing. Also special thanks to the University of Hawaii Computer Science department for hosting a LAN for the final beta testing.